On Christmas eve the snow began falling in Bedford about one in the afternoon. By 8PM we had accumulated about two inches of snow. I know that isn't much by northern standards, but this was the first true "white Christmas" here in my lifetime! 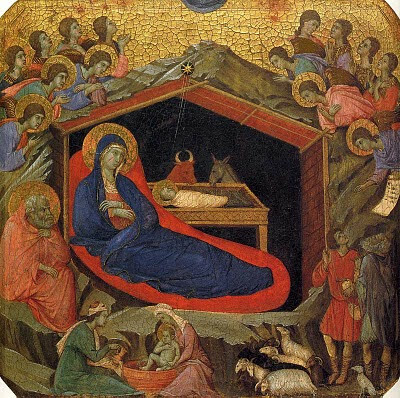 While St. Vincent's often sees more than 600 worshipers on Christmas eve, our Christmas morning service is a quiet, reflective Eucharist which typically has about 35 congregants. 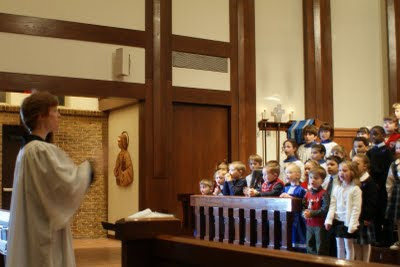 This year we saw a "white Christmas" for the first time more than three decades here in North Texas, which did reduce attendance at the Christmas eve Eucharists. But surprisingly, despite icy streets, more forty people came on Christmas day. It was a lovely service at which Fr. Kalimi of our African Fellowship celebrated the Holy Mysteries and I was honored to preach. Get a copy of "Being Faithful" today! You will not regret it. The Theological Resource Group of GAFCON has produced a remarkable commentary on the Jerusalem Declaration entitled Being Faithful: The Shape of Historic Anglicanism Today. I have found it to be a remarkably helpful read and urge all of this blog's readers to obtain a copy. --the priority of evangelism for all Christians in response to the great commission of Jesus Christ. Welcome [in Advance] to the Fold, St. Andrew's--Mt. Pleasant, SC! Clicking on the title of this post will take you to the official announcement by the Vestry of St. Andrew's Church in Mt. 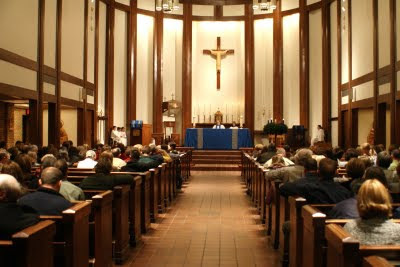 Pleasant, South Carolina--the largest parish in the Episcopal Diocese of South Carolina--that their parishioners have overwhelmingly expressed their desire to leave TEC and become part of the ACNA. While a great deal remains to be worked out with respect to the new ordinariates being created for converts to Roman Catholicism from Anglicanism, the BBC today reports an interview (click the title of this blog entry to read it) with Monsignor Andrew Faley, Assistant General Secretary of the English and Welsh Catholic bishops' conference, in which Mgr Faley details some aspects of how the new structures will function in the U.K.
Those who imagine the ordinariates will function with a high degree of autonomy from the Roman rite parishes in their neighborhoods (like some sort of Anglican "uniate" church) may be disappointed to read Mgr Faley's comments to the BBC that "ordinariate members would be expected to co-operate with their local bishop and the life of their local Catholic parish. 'They can't live separate from it... that would be a "sect" approach and that would not be tolerated within the Catholic understanding of the church,' he said." Mgr Faley indicates that one should not assume the new quasi-episcopal ordinaries will be former Anglican bishops. Indeed, he thinks it is unlikely that they would be so in England: "Within the nature of the bishops' conference as it currently stands it's almost certain that the ordinary of the ordinariate would be a celibate Catholic bishop. ... There is the possibility that he would be [a married former Anglican bishop] - but within the culture of the bishops' conference I think that's highly unlikely." In England Mgr Faley says it is unlikely that the former Anglican parishes who join the ordinariate will be able to retain their buildings. They will more likely share facilities with a neighboring Roman rite parish. The new ordinariate parishes may be served by married former Anglican priests who are subsequently ordained as Roman Catholic priests. However, married men who have not been ordained as Anglicans before they enter the ordinariate will not eligible for ordination. (Mgr Faley does not speak to the question of married men who are already candidates at the time they convert but are not yet ordained.) This was reasonably clear from the Apostolic Constitution itself, but Mgr Faley's remarks do remind me that there will probably not be very many married ordinariate priests within a few decades. Of course, things might be quite different in the United States. But these are interesting observations, nonetheless. 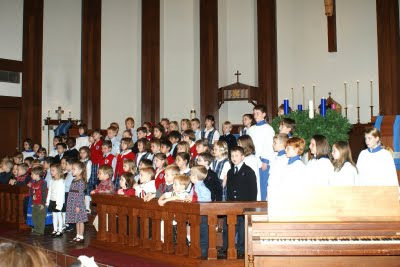 St. Vincent's School Lessons and Carols 2009 A.D.
Last night the choir of St. Vincent's School (fourth through eighth grades) and the lower school music classes (kindergarten through third grades) lead our worship at Advent Lessons and Carols through their beautiful offering of music to God's glory. 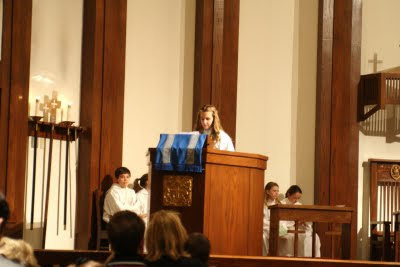 In addition to the glorious singing, six members of our fifth through eighth grades served as readers of Holy Scripture. They were joined by two of our recent alumnae (now students at Nolan Catholic High School and Fort Worth Christian School) and by our middle school English teacher, Mrs. Wren, who also served as readers. The congregation exceeded 300. It was a remarkable evening of prayer and praise. Thanks be to God for the many talents He has given to our students, and thanks to the kids and Mrs. Fergus for all their hard work in preparing for this service. My father took this lovely photograph tonight at Donna Park in Hurst, Texas. The heart-shaped break in the clouds reminded me of the unfathomable love of our Lord for mankind manifest in the first Advent of Christ our Savior. Clicking on the title to this post will take you to a story from today's Washington Times about the pending formation of an new Lutheran denominational body. The Steering Committee of Lutheran CORE, a group of traditional Lutherans who has been opposing the leftward slide of the Evangelical Lutheran Church of America, has voted to form a separate church structure in the aftermath of the ELCA's national Synod's vote to jettison Scriptural teachings on human sexuality last summer. It is striking how closely ELCA's slide has paralleled that of TEC. May God bless Lutheran CORE richly as they strive to be faithful to the Gospel of Jesus Christ and to answer God's call to righteousness.